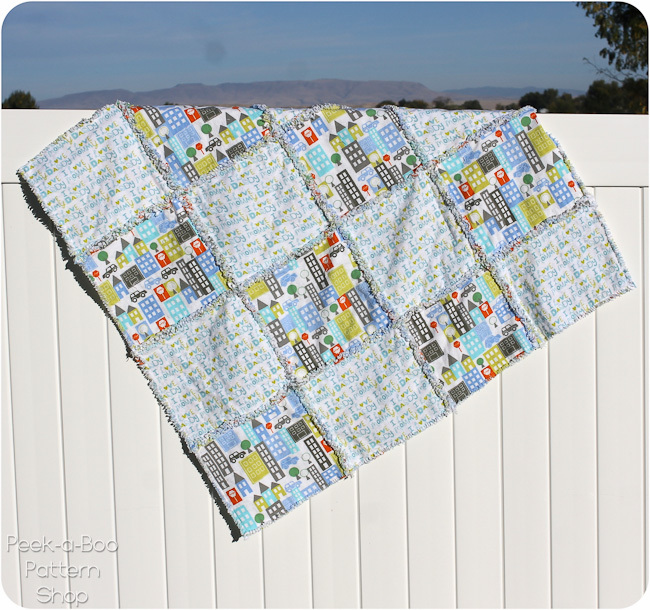 Today I have a 30 minute rag quilt pattern tutorial to share with you! 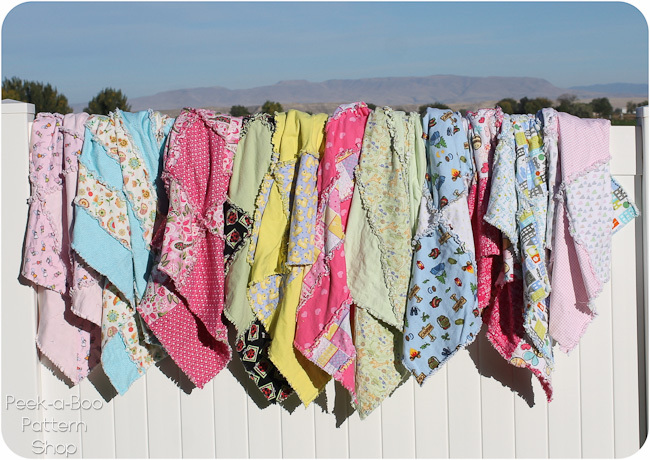 I was able to sew each of these rag quilts in under 30 minutes. I had then had a group of women at church help me snip the fringe and we donated them to a children’s shelter. 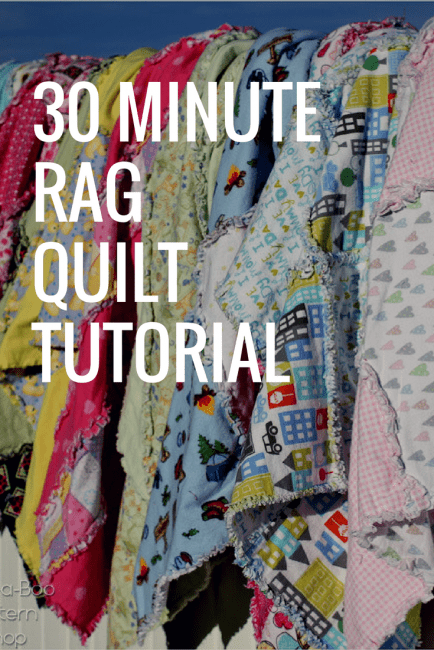 The rag quilt tutorial is a great project to work on with a group because anyone can snip fringe and it’s fun to chat while you snip 🙂 We didn’t get through the whole pile so some of the 8-12 year old girls worked on a few as well. It’s a great way to get the kids involved! 4. Trim any uneven edges and then sew around the entire quilt 1/2″ from the edge. Now snip, snip, snip! I snipped my fringe about every 1/4″. After you’re done toss it in the dryer and it will fluff up. Previous Post: « Final Day of Auditions! Would this work with cotton also, or would it “string up” too much? Someone asked if there were 4 pieces of flannel sewed together or. Two pieces; can someone give an answer. And she stated all you see is two pieces of flannel sewed together…. It is 4 pieces, each square is 2 pieces with wrong sides together. 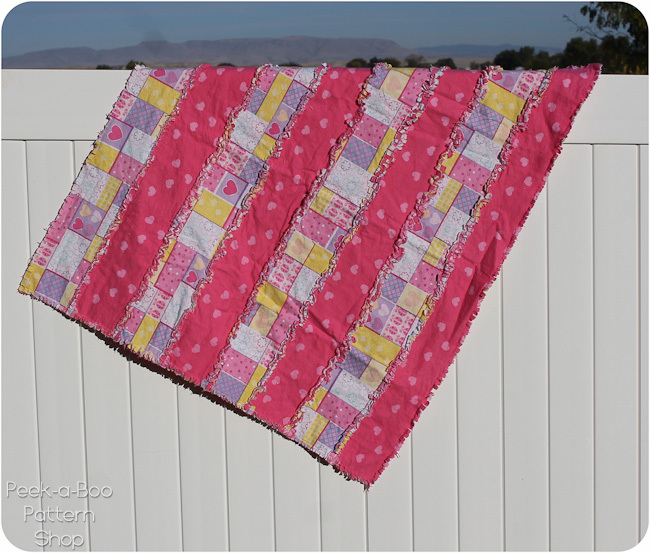 I cut one or two 1″ strips of flannel to fit all around the outside of the quilt. I sewed it at 1/2″ on to each edge with edges even and flannel strips right side up, then fringed all layers like the rest before I washed it. That finished the edge very fluffy. 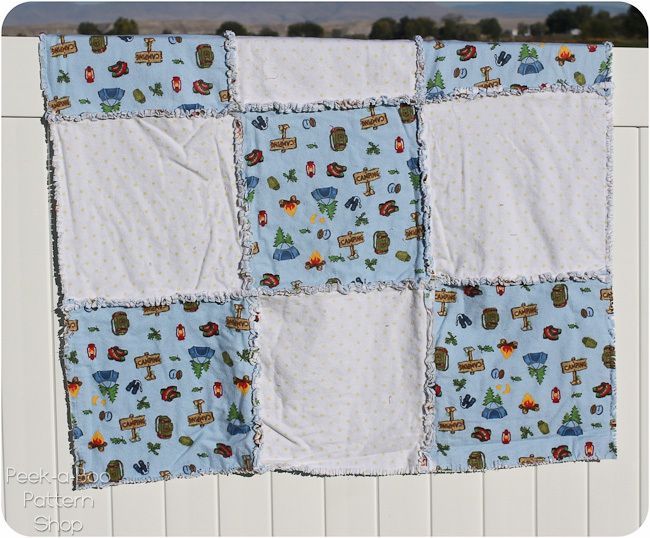 Do you wash your flannel before you start cutting the quilt squares? How do I save these directions for later use? The easiest way is to copy the text and paste it into a document in a word processor. 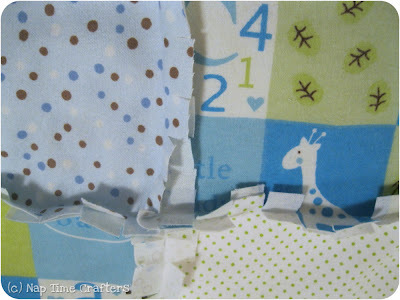 If you have 2 squares on top of each other & then you sew it to the next square in the row which also has 2 squares (top & bottom), how come your pictures only show 2 raw edges of fabric in each seam? Wouldn’t you have 4? Or am I just not seeing that correctly in your pictures? And were all your fabrics in the pictures flannel? I can’t wait to make these. Never thought about doing this without batting/flannel between layers. This is a great idea for our CA weather. I have always sewn X’s on each block. A little more time though. love this idea, I am going to try this soon! Nope. 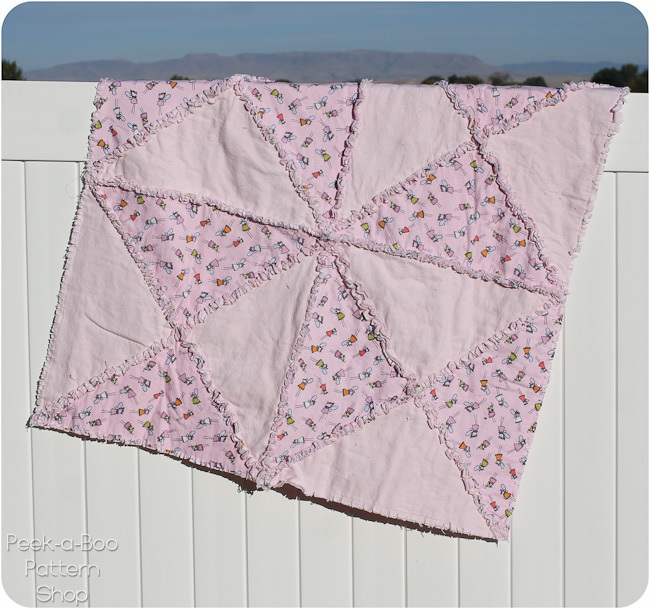 Rag quilts don’t generally have batting. Did you say what size seam to take? 1/4 inch or 1/2 inch. If making 1/2 inch snips you would need at least 1/2 inch or more. Do you do the “rag” part on the edges too? Or binding? Did you attach the front to the back anywhere else besides around the edges? 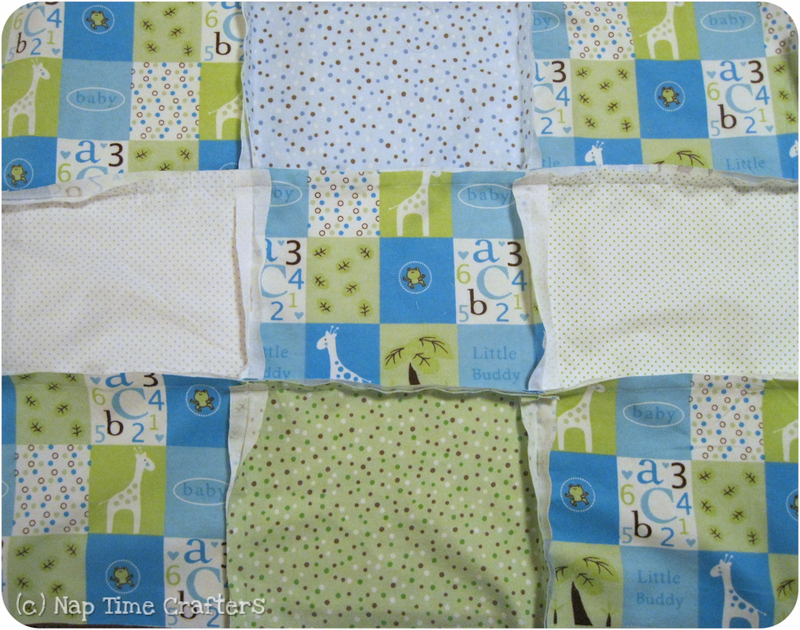 Would love to know what size squares/rectangles you used, and the over all size of the blanket. 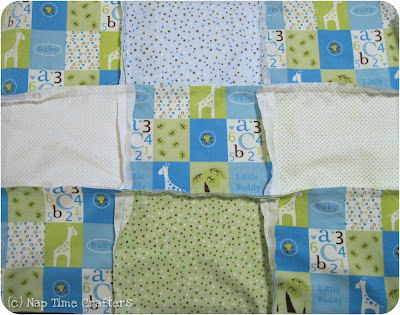 What a great idea.. my son is now almost 18 months and just thought about using his receiving blankets that are WAY to small now! 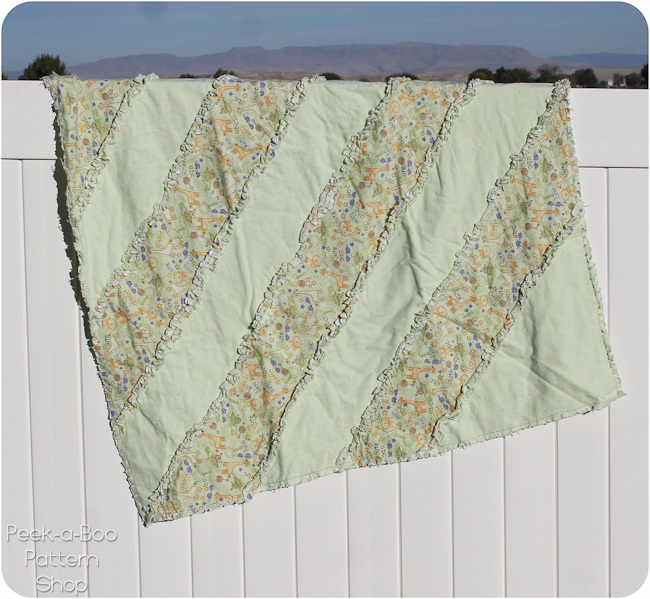 Loved you 30 minute rag quilt. I’m getting ready to do one. I would say these squares are probably 13×13 so finished size 12×12 squares. That would make it 36×36. This is very cute and quick. 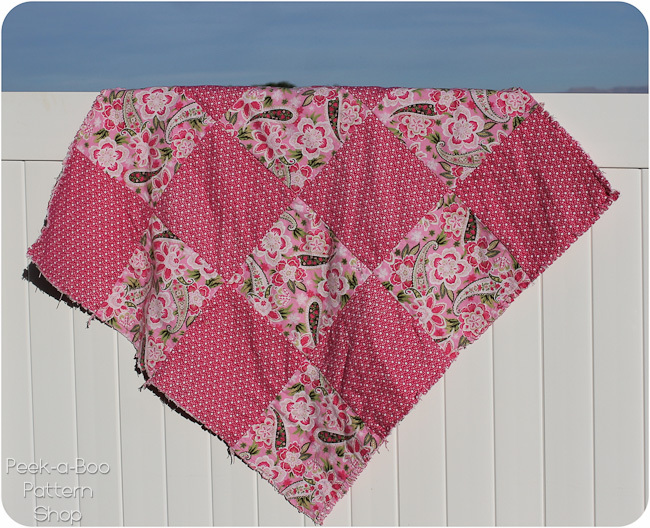 What size squares did you cut out for this particular rag quilt? I plan on doing this for my son’s teacher is having boy/girl twins… quick easy and still fun! Sooo cute!! I always wondered how to make these!